Hofmann, with its many years of experience in the application of plate heat exchangers, has proposed a variety of heat exchange schemes for closed-loop circulating water systems, oil cooling systems, heat recovery systems for power plants. The best use of energy is to improve the efficiency of power plant. In order to reduce the emissions of coal gas emissions to achieve the purpose of energy saving and environmental protection, you can use blast furnace gas combined cycle power generation equipment for blast furnace gas recycling. 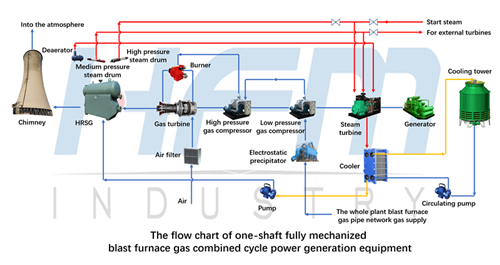 The remaining waste heat steam from steam turbine power generation is cooled through the plate heat exchanger and then flow into the waste heat boiler through the feed pump, after generate steam, and then enter the steam turbine to generate electricity, to achieve the purpose of circulating water. Hofmann plate heat exchangers are not only to meet the requirements of the conditions, but also has a compact structure, small size, high heat transfer coefficient, high heat transfer characteristics, which is your best choice in this condition. Firstly, send the steam generated by the boiler to the turbine, and then the turbine rotates the generators to generate electricity. 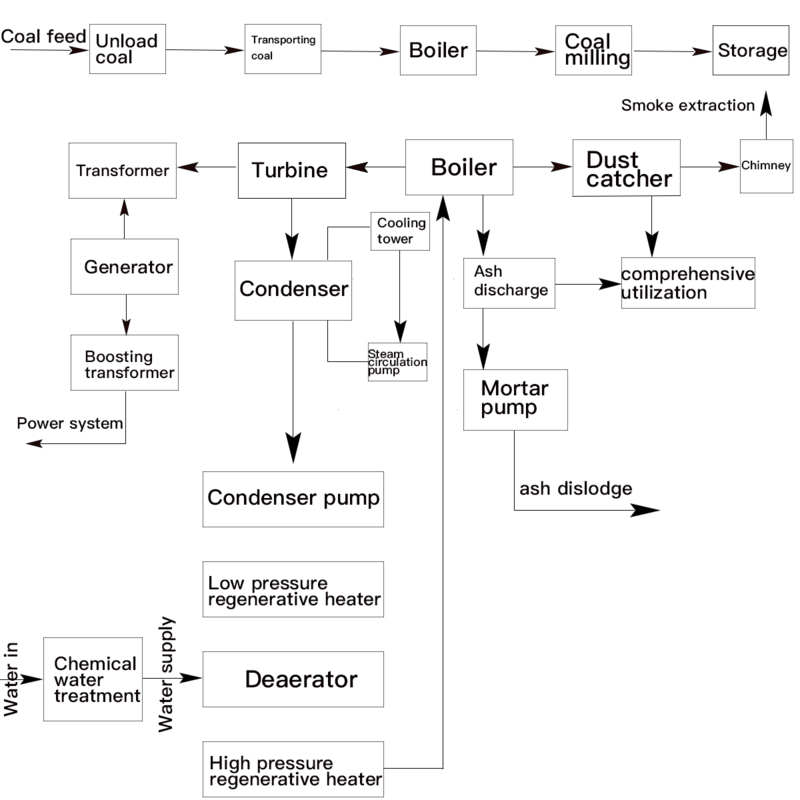 The turbine exhaust enters the cold-end equipment called condenser and condenses into water, which is sent by the condensate pump to the pump, and then into the boiler. Thus it forms a cycle which enables the constant circulating power generation in the power plant. Thermal power plant using coal as primary energy adopts the belt-conveyor technology to transport the pulverized coal to the boiler. By the pulverized coal combustion, the water in boiler is turned into steam and it flows into the high-pressure cylinder after primary heating. To improve the thermal efficiency, it is necessary to reheat the steam and send it into the intermediate-pressure cylinder to drive the turbo generator to generate electricity. Then extract the steam from the intermediate-pressure cylinder into the symmetric low-pressure cylinder. Part of the steam which has done work is extracted in the middle section and sent to the brother enterprises such as oil refining and fertilizer enterprises, the other is cooled down by the condenser and turns into saturated water (about 40℃) used as recycled water. The saturated water (about 40℃) passes through the condensate pump and the low-pressure heater in which it is heated up to 160℃, then flows into the deaerator. After deoxization, use the feed pump to send it into the high-pressure heater which uses the reheated steam as heating fuel, and then the steam flows into the boiler for recycle. The above is the primary production flow. Oil cooler of gasoline engine: tubular oil cooler. Working principle: water flows from the water chamber into the steel pipe while the oil flows within the shell and outside the tube bundle. Water and oil exchange heat through the pipe wall. Condenser: it is equipped with a large number of copper pipes. When the exhaust steam from the turbine contacts with outer surface of the pipe, it is cooled down by the circulating cooling water in the pipe, releases latent heat of vaporization which is continuously taken away through the pipe wall and turns into condensation water. High pressure heater: surface heat exchanger, which is a mixing heater connected to the high-pressure feed pump and used to heat up the feedwater and improve economic efficiency. The heater inside is covered with slim tubes, with boiler feed water and condensation water inside and oil gas extracted from the turbine. Through heat transfer, the temperature of the feed water and condensation water increases while the oil gas is condensed into water extraction and renders hydrophobic, which of the high-pressure heaters generally flows into the high-pressure deaerator and which of the-low pressure heater is pumped into condenser by the drainage pump. Low-pressure heater: it is connected to the sealing heater and used to heat up the condensation water in the high-pressure deaerator and improve economic efficiency. Air preheater: it is a rotary heat exchanger and a regenerative heat exchanger operating in countercurrent. Heat storage elements with special corrugations are closely placed in fan-shaped rotor chambers where the rotor rotates at 0.96 rpm and there are exhaust-gas channel and air channel in the left and right side. The air channel is divided into primary and secondary air channel. When flowing through the rotor, the exhaust gas releases heat to the heat storage elements which reduce its temperature. When the heat storage elements rotate to the air side, it releases heat to the air and increase its temperature. This constant circulation achieves the heat exchange between the exhaust gas and the air. Slag cooler: it is mainly composed by the double-layer sealing sleeve welded with the fixed spiral blade inside the internal cylinder, the inlet and outlet slag device, the inlet and outlet water device, transmission device and base system. When the slag cooler driven by the transmission rotates slowly, the high-temperature slag exhausted from the boiler is guided forward in the internal cylinder of the sleeve. The cooling water flowing reversely in the jacket between the internal and external cylinder takes away heat and gradually cools down the hot slag. The air cooler in the generator: using air as a cooling medium and cooling down the stator, rotor windings and a stator core. There are generally two kinds of cooling modes: open-circuit ventilation and closed cycle. Open-circuit ventilation directly using the air around the generator as a cooling medium is generally composed of air suction inlet, filter, inlet, outlet muffler and outlet air channel. The air is suctioned by the fan and sent to the generator's heating parts for cooling, and then exhausted through the outlet muffler and air channel. This cooling mode costs less, but it is only applied in the conditions where the ambient air is clean, contains no salt spray and its temperature relatively low, otherwise it will lead to the blockage in the channel or the corrosion of the medal parts (such as retaining ring) which affects the safe operation. The cooling air of a closed-cycled generator runs in a closed cycle in the cooling system, thus it is necessary to install a air-water cooler to take away the heat in the air.